Facebook has announced that its "Discover" tab for finding featured bots, nearby places and businesses will be rolled out for Messenger users in India. 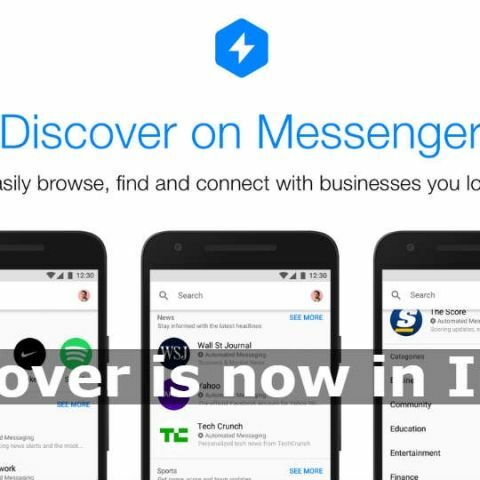 "We are excited to announce that starting today we will gradually be rolling out the Discover tab in India, a new feature in Messenger that makes it easy and simple for people to find and browse bots and business pages," the company said in a statement. Located at the lower right-hand corner of the Messenger home screen, "Discover" can browse recently visited businesses, featured experiences and categories, with two of the categories expanded and rotated out on a regular basis. Both the featured unit as well as the bots and Pages in the various categories are refreshed regularly. The "Discover" tab was initially rolled out for people in the US, at Facebook F8 2017 Developer Conference held in April. "After (finding) promising results in the US, we have decided to launch the Discover Tab in additional countries, including India," the statement said. The "Discover" tab works with new parametric Messenger codes, where people can scan the codes through the Messenger camera and link to their favourite brands and businesses. Facebook also added chat extensions to the Messenger app that allow multiple people to chat with the same business at the same time. Users can now add in a bot directly in a group thread and share the conversation and experience.